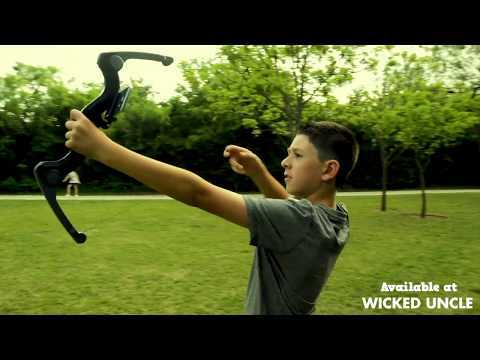 What if Robin Hood and his Merry Men could've practiced their aim with a virtual archery app? Might've been a totally different story for Sherwood Forest! The kit includes a folding arm archer's bow, with toggle buttons, mobile phone holder, handle, indicator light, and battery compartment. Simply download the app, and experience real-time action in an augmented reality video game with YOU as the first-person archer! Highly portable and cutting edge, you can practice your archery skills anywhere, any time. Multiple games of skills with varying levels of difficulty are available, so even if you've never held a bow in your life, you'll be well on your way to vanquishing virtual enemies in far-off jungles, thick forests, and made-up fantasy worlds! Size: 13.5" x 6" x 1.5"
Virtual reality phone magic - interactive magic set with App.